On this road into the world of Interior Design, I have discovered many designers who have become my role models from afar. A friend at work put me onto Cheryl Eisen of IMG who is a super talented NYC designer. In my research of her and her work, I was lead to her inspiration Kelly Hoppen. Since then I have followed Kelly’s work who has been designing for the past 40 years and is the author of nine design books to date. That said here are a few picks from her Mid Season Sale we are LOVING! This Neutral Living Room design that can be seen HERE from our portfolio of work was very much inspired by Kelly Hoppen. PICKS FROM THE MID SEASON SALE GOING ON NOW!! This natural linen cushion has a simple elegance which is enhanced and transformed by the contrast of the taupe velvet band. Banded cushions are a personal favorite of mine and part of my signature look. Our cushions are filled with nothing but the finest curled duck feathers for a luxurious finish and the ultimate in warmth and comfort. Nothing says contemporary elegance more than a combination of black on linen. Banding the simple linen cushion with exquisitely rich black velvet creates a striking visual contrast. Pairing the textured fabric of the natural linen with the softer, more sensual feel of the rich velvet further extends the contrast. Our cushions are filled with nothing but the finest curled duck feathers for a luxurious finish and the ultimate in warmth and comfort. Handcrafted out of solid marble and inset with brass for a decadent gold detail, the Carrara Bookends are simple yet beautiful in their design. The gentle curves and shape of this gorgeous bottle vase are exquisite. The delicate form is wonderfully enhanced by the antique silver finish. Create an air of elegance in the home with different shaped vases of the same silver finish to create a sophisticated grouping. Attract attention to your room with the exotic Gold Wave Vase. With its simple groove design in waves/ripples, the brushed metal vase will make a great addition to a table or sideboard. Style with strong green foliage or with the Copper Wave Vase to create the Kelly Hoppen signature East meets West look. 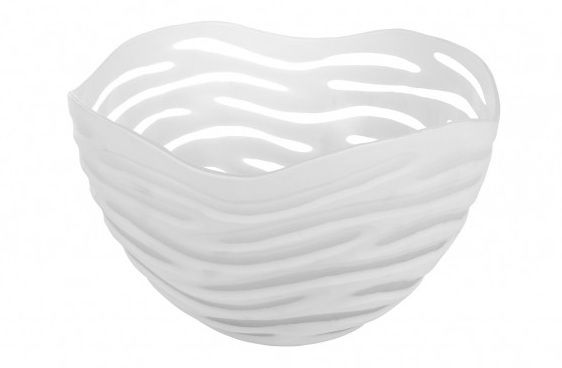 The Edgewater Bowl is stunning in its simplicity. Crafted from white opaque glass with an elegant wave-like texture and fluid lines that open up to reveal a smooth, reflective glass interior. Bring some eastern promise and harmony to your home with our Buddha. With a high shine finish it will make a stunning eye-catching centrepiece, promoting good luck and positivity throughout your home. Design Masterclass is the definitive home-decorating guide from Kelly Hoppen, offering invaluable professional advice on both the practical and aesthetic aspects to interior design. In her book Kelly shares her trade secrets and expert knowledge to help you ensure that your decorating project, however big or small in scale, runs smoothly, comes in on time and within budget, and achieves a functional, flexible interior that suits the way you live. Accessories and pillows are the last details to really help to personalize your space. Don’t forget to add these in to create a polished room. If you need help adding that finishing touch to complete your space reach out to us HERE. We’d LOVE to help you create a space you that inspires and rejuvenates you after a long day of work.